Map of Kantō Plain; Tokyo Bay is visible below center of picture. The Kantō Plain (関東平野 Kantō heiya) is the largest plain in Japan, and is located in the Kantō region of central Honshū. The total area 17,000 km2 covers more than half of the region extending over Tokyo, Saitama Prefecture, Kanagawa Prefecture, Chiba Prefecture, Gunma Prefecture, Tochigi Prefecture and Ibaraki Prefecture. The northern limit borders on the Abukuma Highlands, Yamizo Mountain Range, Ashio Mountain Range, and a volcanic field associated with the Nasu Volcanic Belt. 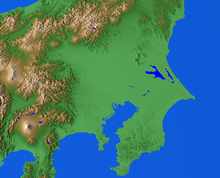 The western coincides with the Kantō Mountain Range and the southern edge is defined by the Bōsō Peninsula, the Miura Hills, Tokyo Bay, and Sagami Bay. The Kashima Sea and Kujūkuri Beach define the eastern end of the plain. Most of the rivers originate in the northern or western mountain ranges and flow east or southeast into the Pacific Ocean, Tokyo Bay, or Sagami Bay. In the central part of the plain is the Tone River; in the northern part the Watarase River, Kinu River, Kokai River, Naka River, and Kuji River; and in the southern part the Arakawa River, Tama River, and Sagami River. Of these rivers, the Tone River encompasses a large area of floodplain, for it has the largest drainage area in Japan of 16,840 km2. The drainage areas covered by these rivers account for the alluvial lowland of the Kantō Plain. A collection of plateaus constitute a large part of the plain. Among them are the Ōmiya, Musashino, Sagamino, and Jōsō Plateaus. These large plateaus are divided into smaller ones by shallow river valleys. One of the common features of the plateaus is that their surfaces are covered with a thick layer of loam of volcanic origin. Volcanic ashes from surrounding volcanoes, Mounts Asama, Haruna, and Akagi to the north and Mounts Hakone and Fuji to the southwest, are thought to have been deposited on these plateaus. Among the plateaus, the Musashino Plateau has the largest stretch of land, extending from the western edge of Ōme to the eastern edge of Yamanote which borders the alluvial plains of the Arakawa and Sumida Rivers. Its elevation gradually declines from west to east, measuring 190 m at Ōme and 20 m at Yamanote. Hills in the Kantō Plain stand on Tertiary strata and rise higher than surrounding plateaus, exemplified by the Sayama Hills and Tama Hills, typically, undulating between 100 and 200 m above sea level. Hills located at the western edge of the Kantō Plain, the Hiki Hills, Koma Hills, Kusahana Hills, and Kaji Hills, also reach approximately 200 m above sea level. What is noteworthy is the overall tilt of the plateaus and hills. In general, the whole area is slightly bent and forming a basin centered in the Tone River and Tokyo Bay. The ongoing process of tectonic extension continues as the plain’s central region gradually sinks. The Kantō Plain witnessed its greatest devastation from an earthquake on the 1st of September 1923, with a death toll calculated of 142,807.